OT: My Hair. It is blue. Yes, I got blue hues in my hair! 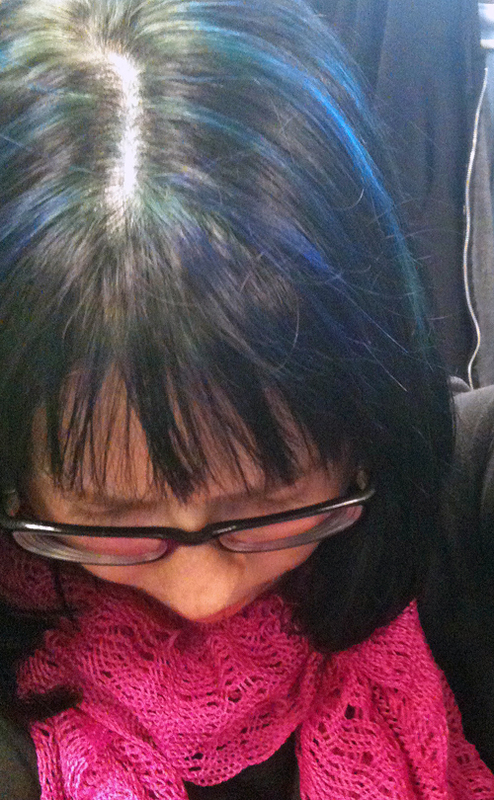 My bright blonde highlights are now darkish blue and the rest of my hair is blue black. It’s not permanent, but my birthday is soon, I’m going on vacation, and I felt like stepping out. Even at 34, I still will manage to freak out my mother. Just because I’m leaving for the Outer Banks tomorrow doesn’t mean I’ll be absent from here. I believe we have WiFi down there and the DH and I will be taking laptops. And I’ll be taking along plenty of knitting supplies and plan on going to Knitting Addiction, a yarn shop in Kill Devil Hill, NC, for an afternoon, just to get away from the family for a little bit. I am excited! And I haven’t even started packing! No, no, I’m not talking bran here. I’m talking wool, in various forms. Sunday, I decided to get out my drop spindles and give then a whirl. (hehe). I think I have the basics down. I don’t have any workable yarn yet, but it is going to take practice. 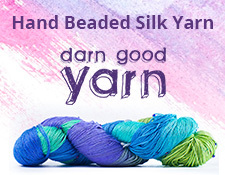 I earned a free class on Craftsy.com, and elected to take their spindling class. It’s interesting. It will be fun to work through it. 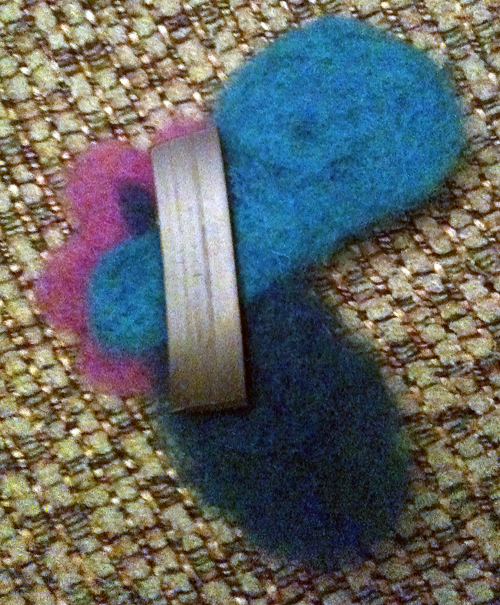 Monday, I decided to needle felt magnets for my craft show, just as little cute things for people to buy. 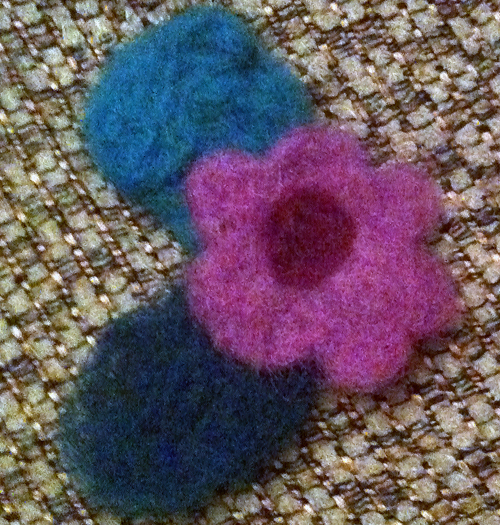 I got so into felting the little flower here that I almost missed an appointment. Luckily, I looked up at the clock with JUST enough time to get there. I zipped out the door. All I did for magnets was cut them into strips and used fabric glue to adhere it to the felt. It seems to work pretty well, if you were wondering. And the felting, I did that free hand. It looks like it was free hand, but I don’t think it’s too bad. In all of this other fiber-y fun, I got two scarves knit. It was heaven. I need a diverse fiber weekend more often. What in the world have a I gotten myself into. What do I have got going for me? Well, my friend Joan is coming over tonight, so we can commiserate about work stuff. 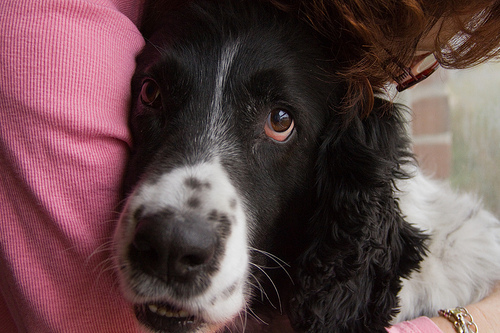 And I’m dog-sitting Patrick here, who is being snorgled by my mom, and time with the Paddy Dog is always nice. I need to just focus on one thing at a time. Tonight, it’s all about relaxation. I have a long weekend because of Columbus Day, so I have a little extra time to get things together, and to get myself together. All in all, I will find time to knit for the show and for myself. I also plan on knitting over vacation, too. I am looking forward to my temporary escape, but the preparation is going to be insane. Blah. It’s true. I am under the weather, so I’m not sure how much updating I will be doing here this week, but I do I have a lot to write about when I am better. Stupid kidney/bladder infection. I just wanted to check in with you guys to know that I haven’t forgotten about you. I’m still knitting and doing crafty things, in between getting myself healthy. In the meantime, why not leave me a comment as to what you are working on right now? It’s October, it’s getting cool, and the itch to wear knitted things is getting strong. I want to know what’s on your needles or hooks!